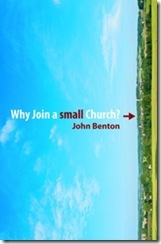 I came across John Benton’s wonderful little book, Why Join a small Church? at a very important and crucial time in my ministry. Benton serves as pastor of Chertsey Street Baptist Church in Guildford, England, and has written such a helpful work in this area, that I cannot recommend it highly enough. I serve as pastor of what some consider a small church (approx. 160-170 on a Sunday morning when the weather holds up). We have a number of folks who come through our church either just to visit, or are looking for another church that is, well, smaller than a number of larger churches that are in our area. To join a big and thriving church is not always wrong, but it is frequently the easy option. To join a little needy congregation is not a decision to be taken lightly. It will probably require far more guts, love, resilience and spiritual exertion. But how the devil would love to herd Christians into a few big city centre churches, getting them to travel miles from their communities, and leaving vast tracts of our country with no viable witness for the gospel. The big churches can spare you. The small churches need you. Small churches give opportunities to serve. Small churches enjoy closer fellowship. Smaller churches will stretch you more as a Christian. Small churches offer you a life’s work of real significance. Small churches offer you the chance to confound the world. Benton closes the chapter by saying what many look for in a church. What’s the music program like? Is the church building impressive? Do the services employ the latest technology? Chapter Two, entitled “Problems You May Face,” deals honestly with the plight of many smaller churches (bad facilities, nothing for children or youth, discouragement, lack of spiritual life, idiosyncracies, stale worship, etc.). Benton even questions the need for planting churches, for he feels that “it is far better, whatever the difficulties, if we can help to build up what is already in existence” (24). Everyone needs to hear the gospel of Jesus Christ and if possible to see it lived out in practical life. When a Bible church closes it usually leaves an area where people have been robbed of the possibility of hearing the gospel. But, in fact, everyone needs to become a Christian and local churches are the God-ordained means of holding out the world of life to the community. Crafted around 1 Peter 1:3-12, Benton gives some helpful and necessary principles on why small churches are so needed. 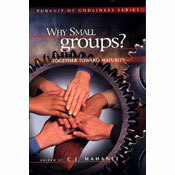 Chapter Four, entitled “How to Make a Small Church a Great Church,” was covered in a previous blog post, so I’ll move on to Chapter Five, entitled, “Encouragement for the Task.” Allow me to list off seven encouragements Benton believes (and I would agree) will help small churches to persevere and achieve great things for God. The potential of the church is far greater than we realize. The Lord is able to use small groups of Christians to transform whole communities. The Lord is able to use the most unlikely people to do remarkable things. The Lord Jesus will build His church. The Lord’s power is not dependent on great human resources. The breakdown of secular society is a sign of how much each community needs small churches. While each person must seek after God as to which church to join, we must make sure that our reasons are not simply due to external looks and resources, but rather they must match up to biblical mandates. We have become a consumeristic society, where we look at churches to see what they can offer us, rather than pouring our gifts into them. Are you someone who prefers a larger church? Why? Do smaller churches not have the ministries or programs you desire? Do smaller churches make you feel conspicuous, whereas larger churches give you a place to blend in and hide? Would you be willing to be used by God to roll up your sleeves and help those small churches out so they may focus on a lost and dying world? Frankly, are you elevating personal preferences to tests of faith? If so, you may well be walking in pride and selfishness, all the while deluding yourselves into thinking you are doing these things for spiritual reasons. To read another fine (and far better) review of this work, click here.